Solar flares are one of the most powerful manifestations of solar activity. This movie shows an interesting flare observed by IRIS, possibly among the earliest flares of the new Solar Cycle 25 after a deep solar minimum. This B4.2-class flare occurred on 2019 January 4 in Active Region 12732 as it approached the northwest solar limb. 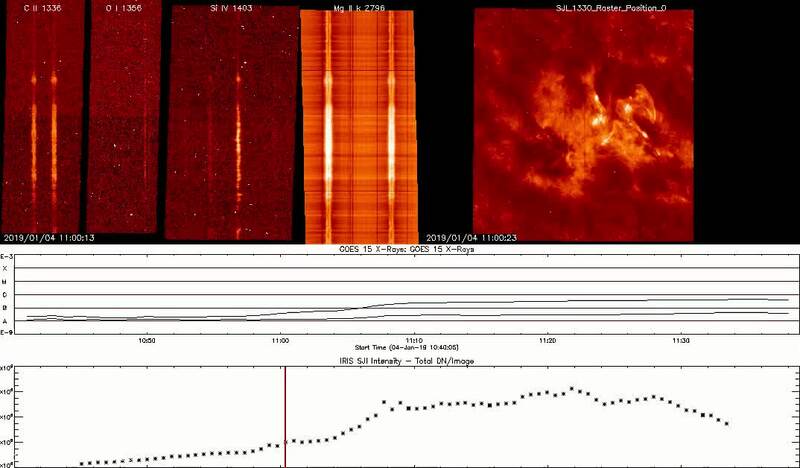 Although small in flare class (meaning low in X-ray flux), this flare had all typical features of a large-scale, fully-fledged flare, including two ribbons on the solar surface that spread out over time with some arcade of coronal loops connecting them. There was also some cool material, likely an active region filament, being ejected upward. All these features were nicely captured in this 320-step dense raster scan under the IRIS slit, which revealed very interesting emission line profiles shown in the left panels, including large Doppler shifts and broad line widths due to flare heating. There is also likely some signature of helical motions due to unwinding twists of the ejected material.